To help me train for the Tufts 10K, Reebok sent me a pair of their new Reebok One Cushion shoe which I’m loving more and more with each run! The Reebok ONE Cushion is part of a whole new collection Reebok is in the middle of launching that I’m super excited about! I can’t wait to see what else they have in store for the future but first a little bit about the Reebok One Cushion. The first thing I noticed about the shoes is that they’re bright (don’t worry, they do have more muted colors but I love me some neon in my life after wearing the black, grey and neutrals to work)! A nice wake up for when it’s cold outside and the sun has barely peaked out yet. They looked a little bulky but they’re actually quite light at 7.7 oz for women and 9.9 for men (similar to my Waverider 16s for reference). The shoe also runs wide enough for those that need it but narrow enough for tiny feet like mine. I wear a size 7 usually and I could have gone down half a size but it wasn’t major deal if I didn’t since my feet tend to swell up a bit after 3 hours of running. My foot first felt loose in the shoe but after I tightened my shoe laces, I was ready to hop, skip and most importantly run! The Reebok ONE Cushion is built-in three zones. All of them fused together to get you anywhere and everywhere faster and injury free no matter where or how the foot lands when you run – of heel, middle, toe. The three-foam midsole, decoupled outsole, and stable lateral arch area is designed to maximize comfort and performance. Although the shoe is “cushioned” as the name implies, I found greater flexibility than expected and is perfect for anyone that craves a more natural fit in a neutral trainer. It responded quite well to my unique run like a duck gait cycle instead of trying control it. Propulsive Zone – a high-rebound foam that gives runners a high level of responsiveness during toe-off. You would think that with three zones, the shoes might feel funky with one part being too soft, another too hard, until you’re more discontent than Goldy Locks, but it was quite the opposite. All three zones are seamlessly integrated together where you don’t notice any discomfort at all as you run besides a smooth run! The only hiccup I had with the shoes were the shoelaces. They kept untying so I had to triple tie them to make sure they don’t come undone. And because I loved the Reebok One Cushion shoes so much, I asked if they would mind giving a pair out to one of my readers, which they kindly agreed to! To enter: visit Reebok One Cushion website to learn even more about the shoe and comment back here on which color you would pick if you won. Additional chances to enter will option up afterwards. Contest will run through midnight on Friday night. U.S. residents only. *Disclaimer: I was provided with these running shoes by Reebok, free of charge through my ambassadorship with FitFluential. I was not compensated for this review. As always, all thoughts and opinions are my own! 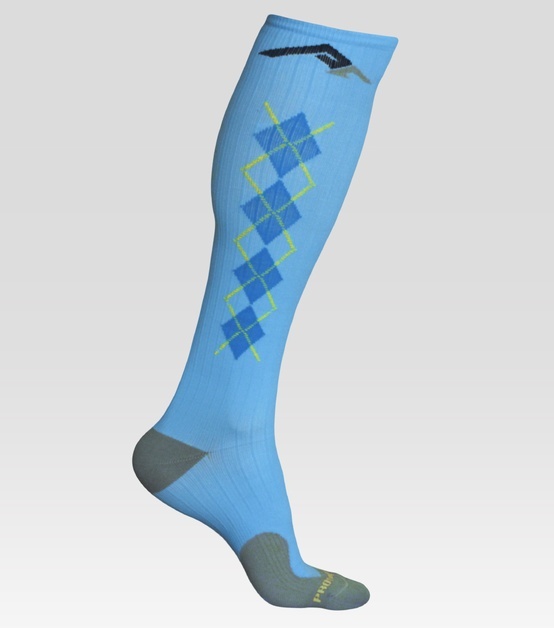 I recently ordered theB PRO Compression Baby Blue Argyle Socks. B There was a coupon floating around for $20 dollars off a pair. B So my total cost was $30 (free S&H) which felt like a steal compared to the $50 I paid for my CEP compression socks (review to follow eventually too). Why compression socks? B Although I don’t usually fall into the runner trends (I don’t even own a Garmin or heart rate monitor and etc.) the potential benefits of the socks have been making me curious. B Plus I’ve always loved thigh-high socks and this baby blue argyle pattern just screamed out to me. Doctors will often prescribe compression footwear for patients who have poor circulation in their legs and feet. The compression footwear applies squeezing action to the legs and encourages better, faster circulation. B Then someone got the brilliant idea to market this to runners. B Although this hasn’t been confirmed, the theory is that the repetitive movement of the runner’s legs applies outward force to the blood, or pressure towards the ends of the feet. This discourages blood flow back to the heart and lungs, which in turn affects the rate of oxygenated blood carried back to the legs. By squeezing the legs around the ankles and calves, the blood is helped to circulate through the legs and feet more efficiently. I won’t go further more into what a compression sock is other than when you open up the package they look small and you can’t just jump into them. B You must slowly wiggle your foot in one at a time like your skinny jeans that are two sizes too small. The Fit & Feel -B They feel really comfortable and soft especially compared to the CEP socks. B The best part is that it feels a lot less medical and more like a casual sock I can lounge around as I recover. B My one gripe is that I think they run too big. B I am 5ft and about 110LBS and therefore ordered the XS. B My legs might be chunky but my shoe size is only 6.5. B If I roll the sock all the way up, it hits past my knee and feels very uncomfortable. B I think compared to the CEP sock, the XS in PRO Compression although is fitting on foot is much too long/tall of a sock for us 5ft tall trolls. B This issue isB manageableB since the material is not completelyB restrictiveB but would have been an issue if the socks were as tight as CEP brands are. Upon ripping the package open with my clawsB bare hands, I wore them all over town on Boston Marathon weekend and in secret during the week afterwards at work as my legs recovered. Sorry kids, this family snapshot of me showing my parents my new house and the ‘hood is the only modeling shot I took. B Next review I promise I’ll have more pictures of the product and myself. Materials & Ease of care-B PRO Compression socks are manufactured using a unique blend of high-performance materials including polypropylene and nylon allowing you sweat it up. B As with all quality athletic wear they should be washed in cold water and air-dried or machine on delicate cycle. B I personally wash all my workout clothes in cold delicate cycle and just allow them to air dry. B This allows me to own things forever until looking at them makes me bored and the voice of materialism and consumption awakens in me. B These socks are also made in the USA which is a rare thing in this economy so support your feet and support American manufacturing. Overall -B I don’t know just how ‘compressive’ your compression socks need to be in order for you to reap the benefits but I thought these worked for me. B I liked that they felt lighter and more comfortable than my other pair. B With other compression socks, I can only wear them for 2 hours at a time while with the PRO Compression socks I was able to strut all over town without my circulation starting to feel completely cut off. I also found that the socks helped with some shin pain I felt after the Boston Marathon. B Although I don’t usually have shin/leg issues (aside from knees) because of the level of walking I did instead of running, my legs felt more shin and feet pain than usual. B I found that wearing the socks helped elevate some of the discomfort while my legs recovered. B Thus I wore them in secret under my pants at work.